Do you like the Pompeii St. Soap Co rebranding and redesign? Would you like to see results like these on your own website? 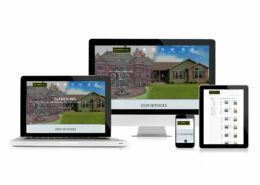 Contact Reich Web Consulting today for a free quote and consultation on your own website redesign project. In the 2 years that Reich Web Consulting has been operating full-time, our most effective marketing effort has been the simple act of walking into a local business, saying hi and offering a business card. It doesn’t always pay off right away. But it does pay off. Jessica Grill is the owner of Pompeii Street Soap Co. located just down the street from me in bucolic Mifflinburg Pennsylvania. Jess contacted us about 6 months after that faithful exchange of cardboard rectangles. Jess is my kind of business owner. She had the courage to be her own boss and runs a successful business producing high-quality and hand-made products. When Jessica contacted us for help rebranding her website, packaging and print material, we were thrilled to help. B-b-but… We Don’t Do Print! These days I’m very explicit about what Reich Web Consulting does and doesn’t do. And we don’t do print. Our philosophy is that it’s better for our customers when we don’t misrepresent our in-house capabilities. But we work with a reliable network of experts. We regularly call on these individuals when their specialties can help our customers. For Pompeii’s rebranding efforts I contacted my friend and colleague Adam Krick. Adam is one of the best graphic designers I know and was a perfect fit for this project. 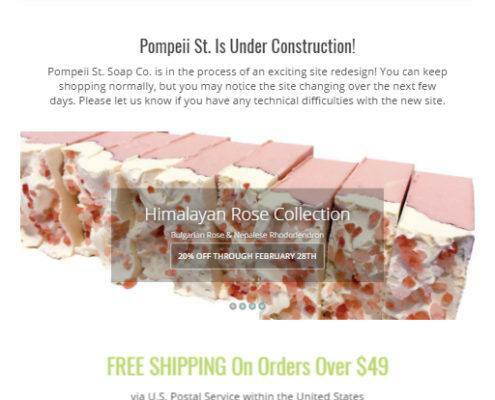 The Pompeii Soap project was a two-part endeavor. First Adam was responsible for creating a new logo and selecting a color palette we would use for all web and print material. After the branding part of the project was completed it was my turn. 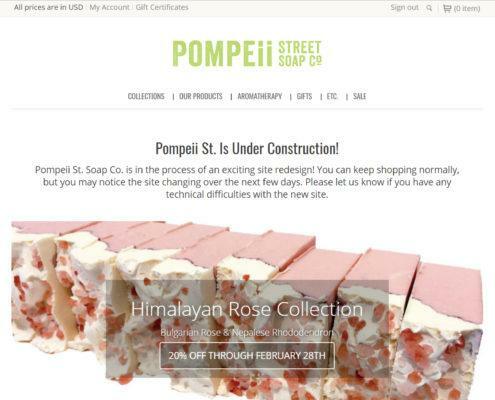 Pompeii Street Soap Company’s website runs on a platform called Big Commerce. Big Commerce is a service that lets business owners easily setup their own e-commerce solution using a collection of free and premium templates. Big Commerce’s strength is also it’s greatest weakness: it’s simplicity. 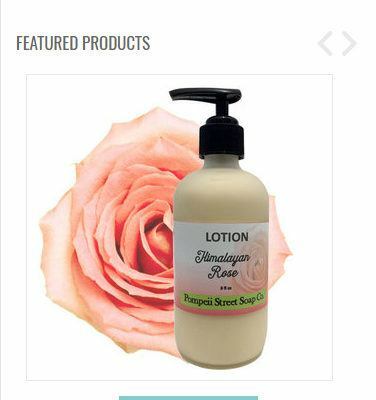 Big Commerce is simple enough for somebody whose not a web expert to setup a simple shop. But it’s simplicity also makes customization pretty difficult. Fortunately we were up to the challenge. 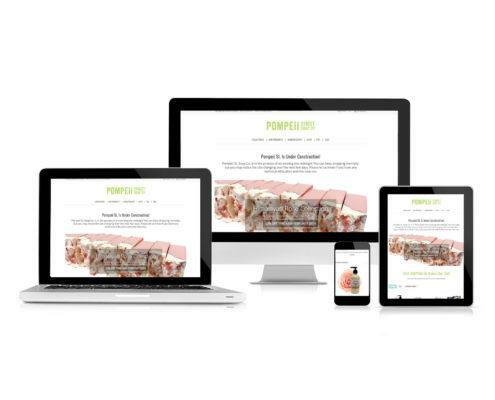 Pompeii’s website was not our first Big Commerce project and we were already well-aware of the challenges we would face. Big Commerce is an e-commerce platform. It is not a general-purpose content management system like WordPress. We kept that in mind and set some expectations with the client at the beginning. 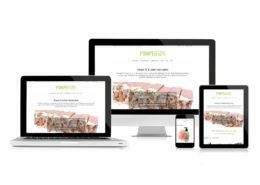 In the end, we took a responsive Big Commerce theme and make it highly-customized. We utilized the client’s new logo. We completely changed the color scheme to match the aqua, green, and pink palette chosen by the client and designer. We customized the font selection, page template, and notification emails. Basically: we turned a generic stock theme into a highly customized website that accurately represented Pompeii’s brand.n my other business website. Work with customer and freelance designer to develop new branding materials for Pompeii St. including new logo, color palette, print, packaging, and web design. Rebrand and redesign Big Commerce website based on a stock BigCommerce theme.